As a architectural visualization artist we Will always have to work with the composition of virtual 3d content created with softwares like Blender 3D, and photographs taken from the actual site where our project will come to be build. The composition process of photos and 3d content has a critical point, which is the alignment of the 3d camera and the camera that took the picture. Both of them have to be perfectly aligned and the perspective lines must match too. In external renderers like LuxRender and YafaRay, we have an option to render our images with an architectural camera, which corrects the vertical lines of the images and make them all parallel. This is a great tool to generate correct images and renderings. But, what can we do if the photo of the construction site doesnâ€™t have the corrected vertical lines, just like our render? For that, we can use a very simple and powerful tool called Hugin. 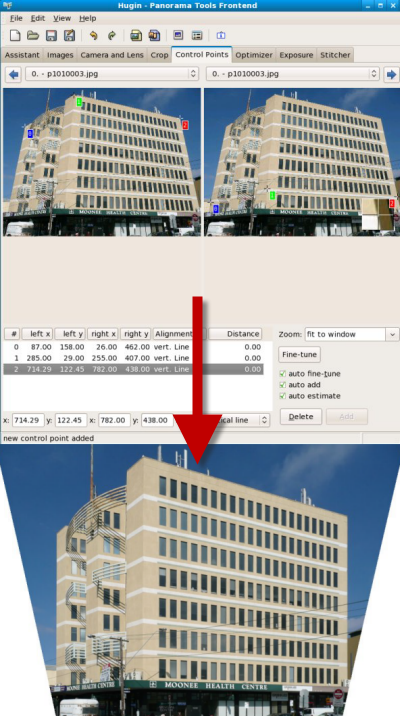 Hugin is an open source panorama photo stitcher that can compose a series of photos into a panorama image, and also work with perspective correction. With this tool we will have control over the photos taken for our compositions and match the perspective used for projects rendered in LuxRender or YafaRay. Even if you donâ€™t get interest to work with panoramas, I suggest a quick look into this tutorial available at the Hugin web site that covers the perspective correction of photos.Â In this other tutorial you will see how to correct the lens â€œbarrelâ€ distortion from photos. One of the uses of Hugin not related with the creation of panoramas is that we can extract textures from photos with just a few clicks. If we have a photo, with an interesting surface that could be used as a texture for a project, but the perspective of the photo doesnâ€™t allow us to use the image as a texture. We can align all the perspective lines of the image in a way that it will look like a regular texture map, taken specifically for that purpose. If you have never tried Hugin, I strongly recommend this software to be in the arsenal of any architectural visualization artist. And we have options to use Hugin available for windows, linux and Os X.